If you want to make your self-published books as professional as possible, it’s important to pay attention to formatting details such as margins and spacing. Today we’re looking at an issue too easily overlooked and often misunderstood, perhaps because it’s invisible: the blank space after a period. Just how big should that space be? One space, two spaces, more? Isn’t this down to the preference of the individual? Can there truly be any rights and wrongs? As indie authors, surely it’s our prerogative to put as many or as few spaces as we like? When we learn to touch type, it’s drummed into us how many spacebar spaces to insert after a period (full stop). When learning to type on computer keyboards, the convention is just one. For those who learned our keyboard skills on typewriters, the convention was two. 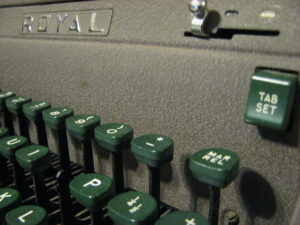 In the pre-computer age, typewriters gave precisely the same amount of space to each letter, regardless of its width. With digitally typeset text, letters are proportionally spaced according to their width, optimising the use of space – so an i, for example, will be given less space on the page than a w. This makes more economical use of paper, as well as being easier on the eye of the reader. So if we’re used to typing two spaces, should we reprogramme ourselves to one? Does it really matter? Two spaces afer a period look like this. As opposed to one after this sentence. Not a big difference to the untrained eye, but enough to irritate a purist. However many spaces you choose to use – and yes, it is your prerogative as an indie if you don’t want to comply with convention – we recommend that, just as with spelling and punctuation, you make sure you are consistent, to provide a satisfactory experience for your readers. Even if you think you have been consistent, it’s easy for extra spaces to creep in during the editing process by mistake, so here’s how to check. Your spacebar spaces will show as dots. The easiest way to check for excess ones is then to type in ” ” (ie spacebar spacebar) into the search box, to highlight each incidence. Then simply delete the surplus spaces/dots. While you’re unlikely to get a negative review for an otherwise fabulous read because you’ve used two or more spaces after each period, it’s attention to detail like this that separates the professionals from the amateurs. Hmm, interesting. As a reader, I find too little space cramped, but too much jarring. Thanks for the advice! I am afraid I don’t write for purists. I write for folk who read. Lots and lots of folk have sight difficulties of one sort or another, and the double space between sentences is MUCH easier to read. This is true for folk with dyslexia, slow readers, and older folk wth sight problems. As I am frequently told how clear my books are to read, I will be sticking to 2 spaces, regardless of what purists think! There are fewer purists in my field. Thanks! I was taught the two spaces way but see the sense of just one. You might try adding a video or a related pic or two to get readers interested about everything’ve written. Just my opinion, it could bring your blog a little bit more interesting. I learned to type with the double space and have since learned it’s incorrect in with digital print. There’s a very quick way to fix it in MS Word though: Just put ” ” in the “find what” box and then put ” ” in the “replace with” box.